In 2016 compared to 2015, fewer projects were completed within budget or met their original goals and business purpose. For every US$1-billion invested in a project, organisations waste around US$122-million - more than 10% - according to the 8th global project management survey conducted by US-based Project Management Institute (PMI). The survey, which involved nearly 3 000 project management practitioners from around the world including senior executives and project management office (PMO) directors across a range of industries, highlighted factors which contributed to project failure and suggested actions to remedy this. 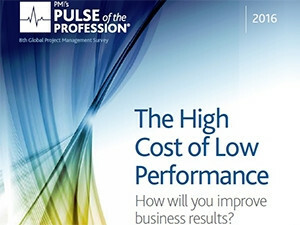 The PMI survey report, "Pulse of the Profession" also noted that the amount of money wasted as a result of poor project performance had increased by 12% in 2016 compared to 2015. In addition, fewer projects were completed within budget or met their original goals and business purpose. According to Mark A Langley, PMI's president and CEO, "project management is essential for any organisation's success, yet the message is not being realised." "We were hoping to see improvement over last year's results. Instead, we saw declines in many of the success factors we track. Even more concerning, the percentage of projects meeting their goals-which had been flat for the past four years-took a significant dip," he added. Although technical skills are essential to project management, the most successful organisations also focus on additional skills in leadership and business management expertise which are required for long-term sustainability and achievement of strategic objectives. The percentage of projects meeting their goals-which had been flat for the past four years-took a significant dip. According to PMI, when organisations have the optimal combination of technical, leadership and strategic and business skills, an additional 40% of their projects succeed. While EPMOs are essential for the implementation of strategic programmes, many organisations fail to utilise the office effectively. PMI found that organisations which align their PMO to strategy achieve a 27% greater project success rate, and 42% fewer project plagued by scope creep. PMI noted that projects are more successful when they have an actively engaged executive sponsor. However, the survey found that on average, only 60% of projects have executive project sponsors. Executive leaders and PMO directors do not sing from the same hymn sheet when it comes to evaluating the organisation's performance in terms of strategy formulation, project prioritisation and funding, and strategic project execution. In fact, according to PMI, they don't even agree on the benefits of using formal project management to improve risk identification and management, customer satisfaction, organisational change and the success of complex projects. It is therefore essential to bridge these perception gaps.